I want part of my life back. I want those hours back – whom do I need to call? All right, I’ll concede that part of the debt I fully own. Some of the meetings referenced above I actually set up and coordinated – meaning someone somewhere is preparing a similar bill for me. The amount of time we spend in meetings in this, the age of technology, isn’t diminishing – it’s growing as the wave of data and information pours over us like hot molasses on a summer’s day. Do they make us more productive? Hmm…..
Data recently published in The Muse tends to make a very strong case that the national debt associated with ineffective meetings is astronomical – and there is little to no definitive action for reconciling time, effort, and profits lost. If we determine time is a zero sum game (for every minute wasted in meetings that don’t offer return another is lost in activities that could be productive) then WHY do we keep doing what we’re doing and expect difficult results…or a better question might be what is causing the problem? Many participants see little to no value – and report their attendance isn’t necessary but often mandatory. There is no structure – no agenda – and no definitive outcome for many meetings. Time slips into a black hole – never to return. Distractions in this age of technology abound (note The Muse article) with 90% of survey respondents admitting to multi-tasking while attending. 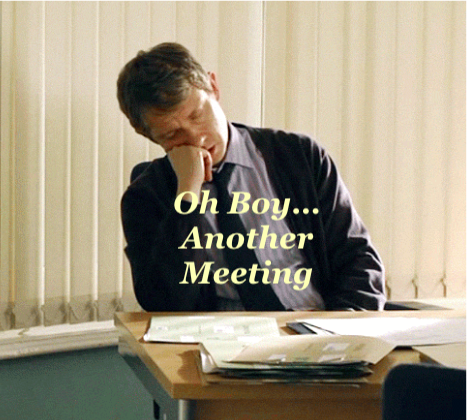 Most meetings are far too long. Every meeting should have a clear objective – communicated in advance to all participants. EVERY MEETING. Every meeting should have a working agenda and a pre-defined time frame (and then cut that allotment in half!) Far too many are ambitious on the front end – lethargic on the back end. Every meeting should have Actionable Items that are made clear with one quick summary at the end – and then followed up on. If there is no action after then the argument can be made the meeting should never have been conducted to begin with. Participants should be limited to the critical few – not expanded to the trivial many.If you don’t have a mission critical reason for attendance you shouldn’t be invited. Every meeting should have a leader and a facilitator/time keeper (and yes, sometimes that can be one and the same.) An important component of that assignment – provisions for “parking lot” issues that are off-topic. The leader or facilitator has to be tough enough to direct tangential points to the flipchart for future discussion – and resilient enough to get the group back on task! Technology needs to be checked at the door – no I Phones, I Pads, Lap Tops, etc. If you’re in the meeting – you’re in the meeting. Ideally any materials are sent in advance – your participants should be fully capable of reading – if you rob meeting time and replace it with library time you’re already sinking. Beware the pitfalls of power point presentations that obscure rather than clarify – wordy, cloaked in “corporatese”, and often more for the benefit of the meeting leader than the participants. Honor the time contract you’ve entered into. An 8 to 9 AM meeting starts at 8 – not 8:10. It stops NO LATER than 9 AM. It’s OK to give back time – it’s irresponsible to take more. Billions are spent each year on an unproductive investment of people resources. Now, back to that part of my life I want back – I have an idea.